The old backboard inscribed [signed?] W Lane delt/from Life. NPG 2076 shows twelve of his disciples,  as listed below. William Cavendish, 5th Duke of Devonshire (1748-1811); the likeness copied from the portrait by Reynolds of 1776. William Wentworth Fitzwilliam, 2nd Earl Fitzwilliam (1748-1833); the half-erased head relates to his portrait of 1817 by William Owen (NPG 4979) see R. J. B. Walker, National Portrait Gallery, Regency Portraits, 1985, I, pp 184-85. John Crewe, 1st Baron Crewe (1742-1829); Lane exhibited his portrait RA 1811 (795). Frederick Posonby, 3rd Earl of Bessborough (1758-1844); Lane exhibited his portrait RA 1811 (360). Dudley Long North (1748-1829); Lane exhibited his portrait RA 1811 (795). George James, 1st Marquess of Cholmondeley (1749-1827); the likeness corresponds with the portrait by John Simpson exhibited in 1825, six years after Lane’s death. Lord Robert Spencer (1747-1831); the source of this image is untraced. Henry Richard Vasall-Fox, 3rd Baron Holland (1773-1840); the source of this image is untraced (cf. R. J. B. Walker, National Portrait Gallery, Regency Portraits, 1985, I, pp 256-58). John Fitzpatrick (1747-1813); from the drawing by Lane engraved H. R. Cook, probably that exhibited RA 1814 (472 ‘the late General Fitzpatrick’). Lord John Townshend (1757-1833);  the source of this image is untraced. Fox had died in the Duke of Devonshire’s house at Chiswick and the attendants at his death bed included Lord Holland (his nephew), General Fitzpatrick, Lord Robert Spencer and Lord John Townshend (who had christened his son Charles Fox Townshend). The inscription/signature on the old backboard, W. Lane delt from Life must be qualified. Fox is taken from the Nollekens bust of 1802 and the Duke of Devonshire (d. 1811) from the Reynolds portrait of 1776, but the other figures might all derive from original studies by Lane. The death of Fitzpatrick in 1813 may provide a postquam non. 1) All by Nollekens, see J. Kenworthy Browne, Apollo, CXXX, 1989, pp 27-32. Also in the St Anne’s Hill House sale were a set of drawings by Henry Edridge, ‘Fox and five friends’ (lots 505-507). 2) See for example, N. Penny, ‘The Whig Cult of Fox in early nineteenth-century Sculpture’, Past and Present, LXX, 1976, pp 94-106. 3) The identities written in an annotated copy of the St Anne's Hill House sale cat. (NPG archive) and otherwise verifiable. 4) Previously identified as George, 2nd Marquess Townshend (e.g. NPG, Complete Illus. Cat., 1981, p 657). 5) Exhibited RA 1810 (544); A. P. Oppé, English Drawings, Stuart and Georgian periods, in the Collection of His Majesty the King at Windsor Castle, 1950, no.408, fig.67. By descent at St Anne's Hill House, Chertsey,1 to the 4th Lord Holland (d. 1859); his widow, who devised property to the Hon L. W. H. [Fox-]Powys, thence to his nephew, the Hon Stephen Powys; St Anne's sale, Phillips, 3rd day, 26 November 1924, lot 502 (Court Scene, by William Lane, the bust of C. J. 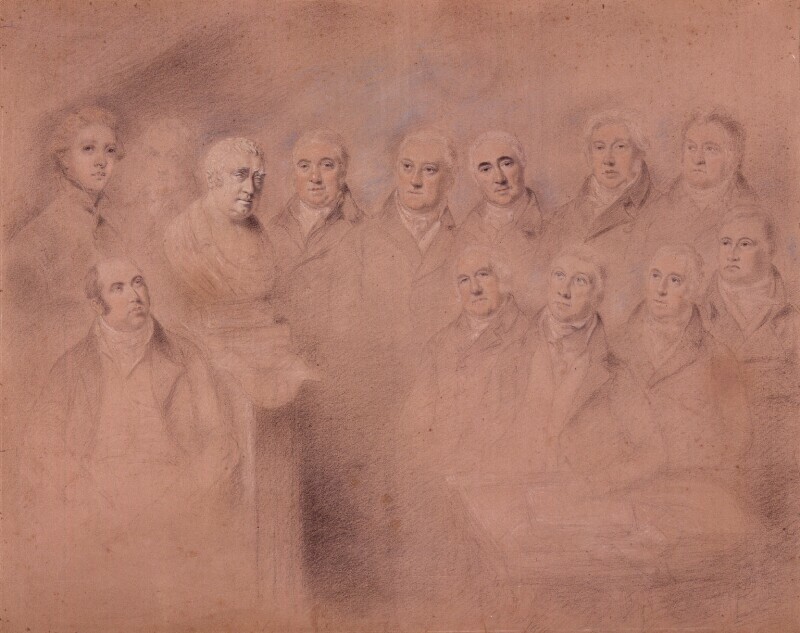 Fox, and 12 notables), bought Leggatt for the NPG. 1 A label in a late-19th-hand, formerly on the verso, read: Mr Fox and his friends in chalk by Wm. Lane/won in a raffle by Lord Holland - presumably the 3rd Lord Holland.